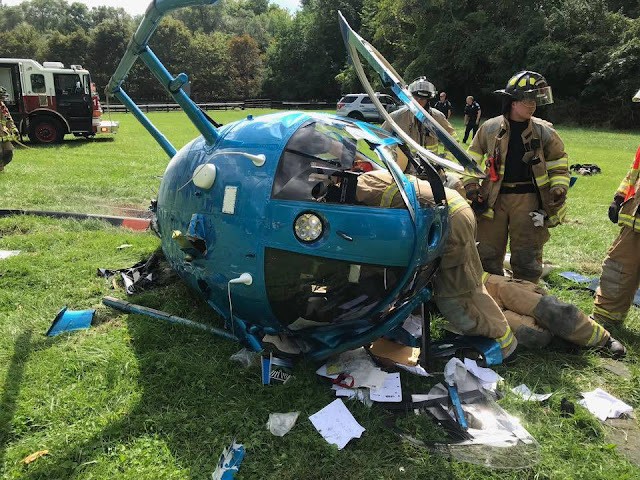 On September 3, 2018, about 1440 eastern daylight time, a skid-equipped MD Helicopters 369E helicopter, N1601Y, impacted terrain during takeoff at Orchard Lake, Michigan. The left seat pilot, the sole occupant, sustained serious injuries. The helicopter sustained substantial damage. The helicopter was registered to HiFlite Inc., Rochester Hills, Michigan and was operated by the pilot under the provisions of Title 14 Code of Federal Regulations Part 91 as a visual flight rules personal flight. Visual meteorological conditions prevailed at the time of the accident, and no flight plan was filed. The local area flight originated from the pilot's private heliport, McPhail Heliport (7MI1), Orchard Lake, about 1440. Law enforcement officers from the Orchard Lake Police Department were notified at 1444 of the accident and traveled to the accident site, located at a private residence. Upon arrival, law enforcement officers observed the helicopter laying on its left side in a grass field with the main rotor blades separated from the main rotor mast, the engine still operating, and the tail rotor system separated from the tailboom. The pilot was trapped inside the cockpit. When law enforcement officers approached the pilot in the cockpit and asked the pilot what happened, the pilot reported, "I don't know, it started spinning." The pilot was asked if he was taking off or landing when the accident occurred, and the pilot responded he was landing. 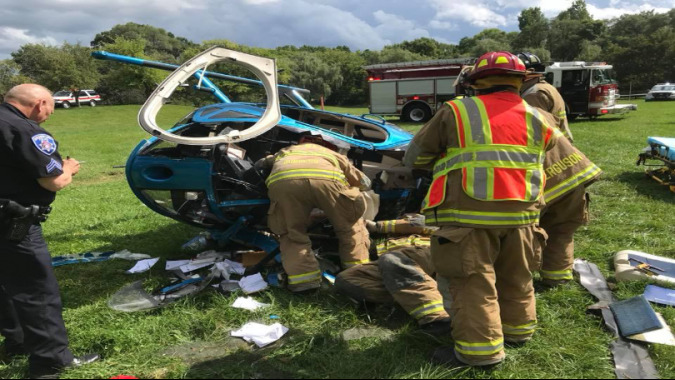 Firefighters from the Bloomfield Township Fire Department arrived at the accident site and the pilot was extracted from the wreckage for transportation to a medical facility for treatment. Photograph 1 - View of the pilot being extracted from the helicopter (courtesy of WILX.com). Law enforcement officers interviewed a witness who reported that she did not visually observe the accident sequence, but she heard the accident from her residence which was in close proximity to the accident site. She further reported that she heard the pilot start the helicopter, the helicopter "ran to warm it up," and that the accident occurred when the pilot was taking off. Two Federal Aviation Administration (FAA) aviation safety inspectors (ASI) from the East Michigan Flight Standards District Office arrived at the accident site about 1530. Photographs provided by the FAA ASIs showed the heliport consisted of a concrete pad on an east to west axis (the touchdown and liftoff area, commonly known as the TLOF), along with a hangar stationed on the west side of the pad. A south to north tree line was located immediately behind the hangar. To the east and south of the heliport was an open, level grass field. Immediately to the north of the heliport, were various power lines starting about 25 feet high and terminating about 45 feet high, with various orange marker balls installed. A wheeled helicopter transportation dolly was found parked on the yellow touchdown/positioning "H" triangle marking. The wreckage of the helicopter was found about 40 feet to the east of the TLOF on the grass field, with the nose of the helicopter oriented to the north. No evidence of an obstacle impact or wire strike was observed by the FAA ASIs. The FAA ASIs were able to establish flight control continuity on the airframe up to the various points of separation due to impact. All components of the helicopter were accounted for at the accident site. In a telephone conversation with the National Transportation Safety Board investigator-in-charge on September 12, the pilot reported that as he was taking off from the TLOF, he observed multiple Canada Geese (Branta canadensis) that "flew at me." He reported that he maneuvered the helicopter to avoid the birds and that was the last sequence of the flight that he could recall. No evidence of bird remains (commonly known as snarge) were located in the wreckage nor in the area surrounding the wreckage by the FAA ASIs. The pilot sustained serious injuries to his head and body. The helicopter sustained substantial damage to the main rotor system, the fuselage, the tailboom, and the tail rotor system. The helicopter was recovered from the accident site and transported to a secure facility. The 4-seat capacity helicopter, serial number 0216E, was built in 1987. The helicopter was powered by a 420 horsepower Rolls-Royce 250-C20B turboshaft engine, serial number CAE-835492. 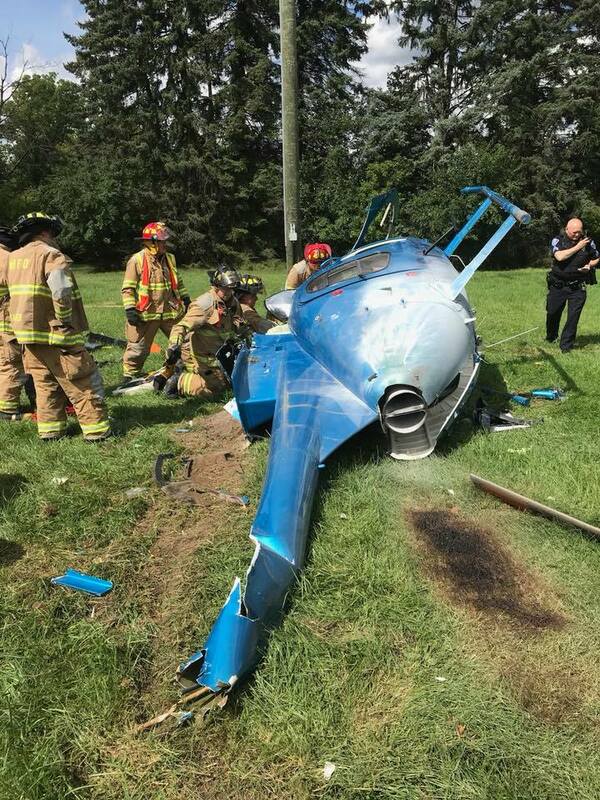 An 87-year-old pilot is hospitalized with what’s believed to be non-life threatening injuries after his privately-owned helicopter crashed on his property in Orchard Lake Village on Monday afternoon. 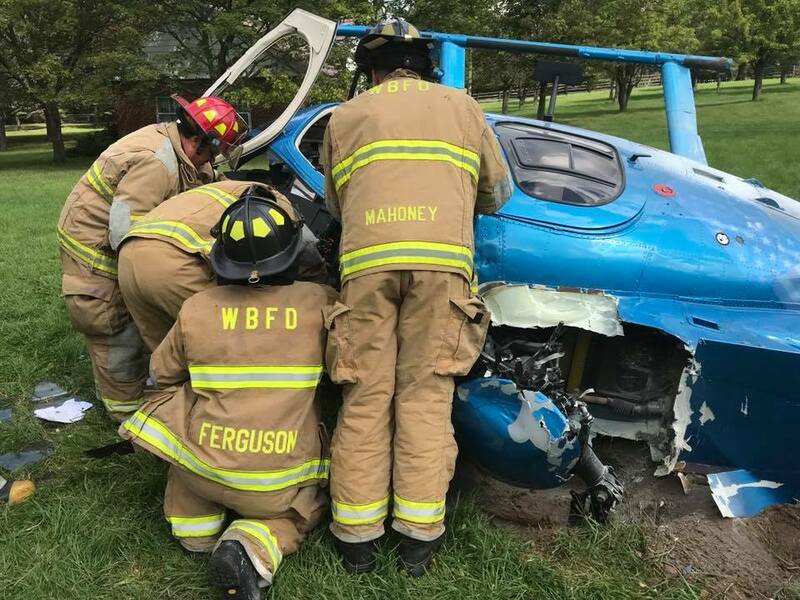 Orchard Lake Police Chief Joe George said the crash happened soon after take-off from the helicopter pad on the man’s several-acre property at 5652 Pontiac Trail. “For some reason, the helicopter went into an autospin, came down and crashed at that point,” George said. Police and fire rescue teams found the helicopter on its side with the pilot trapped inside. They managed to push the helicopter over to free the man. The pilot was the lone occupant of the helicopter, and no other injuries were reported. A small fire spotted by rescue teams when they arrived self-extinguished, George added. As of Tuesday morning, the man was listed in stable condition as he recovers from his injuries, George said.